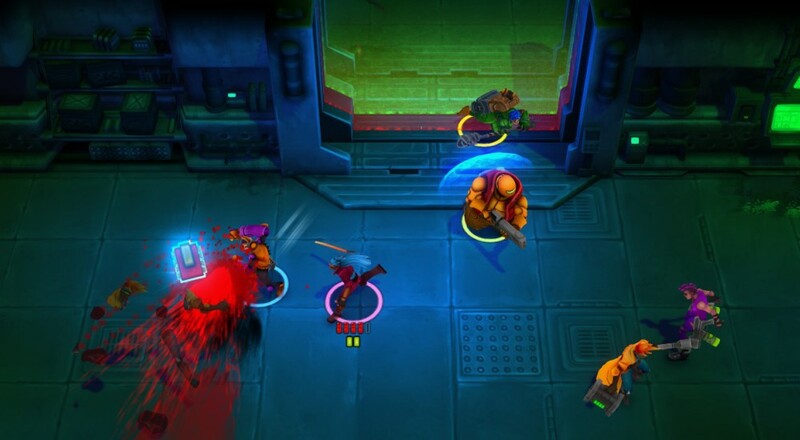 The cyberpunk shooter Kill to Collect has received its first free DLC pack today. What was once called "Free Play" mode is now titled "Warzone" and has undergone some big revisions. In addition to those changes, some new weapons and power-ups have been added, along with a few game tweaks. Previously, "Free Play" mode would allow players to take on a randomized series of floors with a bounty at the end. The new reworking shakes up all of that randomization even more and dividing the action up into three blocks, each one more difficult than the last. Rather than a shop, health station, and upgrade station at the end of each floor, those elements are scattered about. Some floors may have three health stations, but no upgrade stations or shops. Some may pit you against minibosses and elite enemies. The array of enemies you can face and their combinations have been mixed up, as well, leaving the whole affair feeling like some random adventure you're undertaking. Should you fail at any point, you'll have to start all over but should you succeed you'll earn a new character skin, an achievement, and a bunch of credits. Along with the revamped mode, Pieces Interactive has added in new weapons, like the Railgun that can fire through enemies (and their shields), and new power-ups, like the Cryo-Pack that will slow enemy movement within a small area. The DLC is free to anyone who owns the game or anyone who buys it in the future. Kill to Collect is available on Steam for $19.99 and supports four player online co-op in all game modes. Page created in 0.7420 seconds.